Ad Impression (hereinafter also referred to as “ads”), displayed on Advertising Spaces, shall be accompanied by the note: «Yandex.Direct», or «Direct», or «Ad». on Yandex.Direct all ads viewing pages (http://direct.yandex.ru/search) returned against key phrases – all ads competing one another. On Yandex service pages optimized for mobile devices advertisements are not displayed or may be displayed in a maximum number below that specified above for a corresponding display space. The place of display of ads on Yandex service pages optimized for mobile devices may differ from the places of display of ads stipulated in these Ad Serving Rules. While selecting ads for impression in ALL search result positions, a key phrase (without stop words (http://direct.yandex.ru/help/?id=990397#990402)), the quality factor, clickability and the cost per click, specified by the advertiser, shall be taken into account. In this case, only impressions and clicks on search result pages of the main Yandex search shall be registered to calculate the click trough ratio (CTR). Impressions and clicks on search result pages of other Yandex services (Video, Images, etc. ), in other search and thematic areas shall not affect it in any way. While selecting ads for impression on pages of the Catalog heads, only impressions and clicks on the relevant Catalog head pages shall be taken into account to calculate CTR. Search result pages of Yandex, Yandex Catalog and the Catalog’s heads shall contain up to three ads of the Special Placement. The Special Placement means a winning advertising place with high clickability, located above the results of search or main contents of a page of the Yandex Catalog. Impression of ads of the Special Placement shall be guaranteed for each query identical to a key phrase (without stop words), specified by the advertiser. Other ads shall be displayed TO THE RIGHT of search results. up to 4 ads displayed statically, that is, unfailingly at each query identical to the key phrase (without stop words), specified by the advertiser, – these are the Guaranteed Impressions. up to 5 ads, displayed out the Guaranteed Impressions, dynamically (that is, alternating each other) in positions under the Guaranteed Impressions – these are the Dynamic Impressions. A total number of ads, rotating in these positions, shall be practically unlimited. 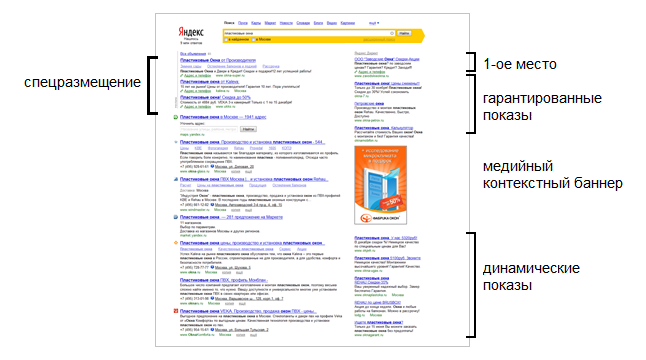 Ads may not be displayed on Yandex Search result pages (except for those of Special Placement), because for some queries, they may be replaced by a media context banners (http://advertising.yandex.ru/media/context/) and/or Yandex.Market (http://market.yandex.ru/) product offerings. Ads with the best rates shall be displayed in the Special Placement and referred to the Guaranteed Impressions. Other ads shall be referred to the Dynamic Impressions. The Special Placement, as opposed to the Guaranteed Impressions, shall have a barrier of entry, independent of the presence of competitors. It is therefore quite normal to have a lot of Yandex.Direct ads with none of them, displayed in the Special Placement. On the other hand, ads with high clickability may often hit the Special Placement at a price below the price of the first place in the right column. Ads of the Special Placement and the Guaranteed Impressions shall be arranged in cost-per- click descending order. As to the Dynamic Impressions, the frequency of impressions shall depend on the number of query rotating ads, their clickability and cost per click. When displayed, these ads shall be arranged in order of decrease in the magnitude, depending on clickability and cost per click. On Yandex search service pages optimized for mobile devices ads are arranged in the order of decrease in the clickability on the Click price. Ads in Yandex Advertising Network (http://direct.yandex.ru/help/?id=990409) thematic areas shall be displayed based on matching advertising material themes and the user’s interests. Selection of ads for impression shall be made by Yandex automatically in view of the product of ad clickability in the thematic area times the click rate. When choosing the criterion of the display ad «Independent placement on different types of sites» in the parameters of the advertising campaign, the Advertiser can set the price-per-Click to display the thematic pages of the web sites of YAN partners. The meaning «Audience Coverage», displayed in the client interface when the Advertiser sets cost-per-Click to display the advertisement on the thematic pages of the web sites of YAN partners, is of informative nature and means approximate number of advertisement impressions in % to the number of impressions of advertising materials on the given keyword on thematic pages of the web sites of YAN partners. Ads on the Catalog heads pages shall be displayed according to the Advertiser’s choice of heads. Selection of ads for impression shall be made by Yandex automatically based on the product of ad clickability on the relevant Catalog head pages and the cost per Click. Selection of Ads for impression on Yandex.Direct view all ads pages (http://direct.yandex.ru/search) and their distribution through pages shall be arranged in order of decrease of the product of clickability times the cost per Click. In this case, the ordinal position of the Advertisement on a page shall be determined in accordance with the established cost per Click, that is, selected Ads shall be placed on each page in order of the cost-per-Click decrease. Impression of Ads on Yandex.Maps search result pages may be accompanied by showing of a special mark in connection with a location corresponding to the address of a company specified by the Advertiser on the relevant Ad contact page. When a user addresses the mark, an «Expanded Mark» block appears containing the Ad text and/or contact details provided by the Advertiser. 1. If CTR (according to the Yandex statistics) of any Ad with respect to any key word/key word group specified by the Advertiser for such Ad or for the relevant Catalog head is below the threshold limit set below in this paragraph, Yandex may suspend or terminate such key word as triggering the placement (impression) of such Ad on the relevant advertising space. search result pages of YAN partner websites. CTR (Click Through Ratio) means a ratio of Clicks to the number of impressions of an ad. 2. In case of overlapping of key phrases and/or Сatalog heads in different ads within one and the same advertising campaign, rates for these key words will not raise the cost per Click for each other. The only one ad whose clickability multiplied by the rate is the best will be chosen for impression. 3. In case of overlapping of key phrases and/or catalog heads in ads, leading to one and the same website, the only one ad whose clickability multiplied by the rate is the best will be chosen for impression. А) Quality factor affecting the minimum cost per click, applied to the search. The quality factor shall depend on a lot of parameters and be calculated in real time. The main parameters are: overall relevancy of an ad to a query, ad statistics, relevancy of a website page to which the link from an ad refers, and other parameters. B) Efficiency factor affecting the minimum cost per click, applied to the search. The efficiency factor shall depend on a lot of parameters to be calculated in real time. The main parameters are: statistical data (impressions, CTR, number of days of campaigns’ activity), aggregated by an advertised domain or phone number (if specified in a «virtual personal card»). If the rate is below the minimum applied to the search, Ads will be displayed only on the sites of Yandex Advertising Network participants and on the page “All Advertisements”. 4.1. The ad clickability rate will be estimated based on the data for the last 28 days, during which the given ad was displayed; or a forecast clickability rate will be used (if no sufficient statistics are available for assessing the rate for the above period). contain links to one and the same or similar websites and/or coincide in terms of indicated and/or actual contact details of advertisers (suppliers). In this case, websites shall be recognized similar, when considerable parts of the offered goods (works, services) range to be sold within one region coincide or when the same goods are offered by the same suppliers (affiliated, having a close relationship), regardless of slight differences in range, different design, websites structural organization, difference in price, as well as websites affiliation to (administration by) different person(-s). When placing ads against a correspondent key word (word group), the only one ad from a group of ads, recognized similar, whose clickability, multiplied by the rate, is the best, shall be displayed to the user. The rest of ads of such a group shall be recognized duplicates – these ads shall not be displayed (placed). The cost of Click, set by the advertisers for duplicate ads, shall not be taken into account (in particular, when determining a place of impression of other ads) during the entire time of suspension of these ads. In the above cases, Yandex shall unilaterally decide on recognizing the ads similar, based on the assessment of available information. 5.1. If any Yandex.Direct ad and any Yandex.Market product offering contain links to one and the same Internet information resource (website)/domain, or to websites recognized according to paragraph 5 as similar thereto, Yandex search result pages will display only one of them, whichever demonstrates the best product of clickability and the cost per Click. other operations from 5 to 180 minutes (average processing time of this operation totals 40 minutes). 6.4. Information on operation processing, associated with the change of the Advertising Campaign’s status, shall be indicated in the client interface. 7. When displaying Ads in mobile devices, the Ad may contain the Link to a website or the Link to a contact page («Call up»). When the user clicks on the Link to a contact page, the user may be only provided with a contact phone number, specified for this ad in a virtual personal card. 8.1. Whenever the cost per Click, set by the Advertiser, exceeds the amount of the Advertising Campaign cash balance, it shall be assumed that the cost per Click is equal to the amount of the Advertising Campaign cash balance. 8.2. The maximum cost per Click for the Advertising Campaign, which can be set by the Advertiser within the Advertising Campaign, shall be defined by Yandex in the following events: a) Advertising Campaign cash balance increase; b) deferred payment billing; c) cost per Click modifying by the Advertiser; d) Advertising Campaign cash balance change, occurred due to the operations, accomplished by the Advertiser via the client; d) active key words change. Advertising Campaign cash balance ×2 / Clicks aggregate forecast, where aggregate Click forecast = ∑ of Click forecast for all key words of the Advertising Campaign. For each key word the Click Forecast shall be calculated as the statistics of a key word /1440 х CTR, where a key word statistics = number of queries (http://wordstat.yandex.ru/) containing a key word, per month. CTR = 0.6%, if the cost per Click, set by the Advertiser, is below 0.21 c. u., CTR = 2.56%, if the cost per Click, set by the Advertiser, exceeds (or is equal to) 0.21 c. u., and is below 1.07 c. u., CTR = 4.12%, if the cost per Click, set by the Advertiser, exceeds (or is equal to) 1.07 c. u. and is below 5.09 c.u., CTR = 12.73%, if the cost per Click, set by the Advertiser, exceeds (or is equal to) 5.09 c.u. 8.2.1. If the calculated maximum cost per Click, set for the Advertising Campaign, is less than 0.05 c. u., the maximum cost per Click for the Advertising Campaign will be set at a level of 0.05 c. u. 8.2.2. Whenever the cost per Click, set by the Advertiser, exceeds the maximum cost per Click for the Advertising Campaign, the maximum cost per Click shall be applied. The maximum cost per Click, set for the Advertising Campaign, will be displayed in the client interface when the processing of the operations, specified in the first passage of Clause 8.2, is finished. «Contraindications. Consult your doctor. Health hazard possible» - when advertising induced abortion medical services. Adding of the above warnings shall be carried out by automatic determination of ads themes and/or via the help desk: support@direct.yandex.ru. The Advertiser shall agree to maintain control over the appropriate ads themes determination and ensure the presence of an appropriate warning, accompanying ads of themes in question. For the time being, ads, accompanied by warnings, will not be displayed on the pages of Yandex.Catalog. 10. If additional links have been filled in for an ad, they shall be returned in the position of the first Special Placement while displaying the ad. While displaying an ad in other positions / on other pages, the ad shall be returned without additional links even if they have been filled in. 11. Should the advertiser use the option «Impressions for additional relevant key phrases», it shall ensure control over the compliance of the added key words/word group with legal requirements, including those of the Federal Law dated March 3rd, 2006, No. 38- ФЗ «On Advertising», the Federal Law dated July 26th, 2006, No. 135-ФЗ «On Competition». The advertiser may set a service cost limit while displaying based on additional relevant key phrases as a percentage against the total cost of services. This restriction shall be applied to the cost of services rendered not less than during one week from the date of such a restriction. 12. While displaying in the Yandex Advertising Network, the advertiser may limit the cost of services as a percentage against the total cost of services. This restriction shall be applied to the cost of services rendered not less than during one week from the date of such a restriction. on pages of Yandex Advertising Network (http://direct.yandex.ru/help/?id=990409) member websites by adding the relevant site address to the list of prohibited advertising spaces in the advertising campaign parameters or by placing a display prohibition with respect to particular Yandex Advertising Network member websites on the advertising space statistics data page (http://direct.yandex.ru/help/?id=990418). in Special Placement by choosing «Displayed to the right of search results» as an ad impression option in the advertising campaign parameters. on the search results pages (http://www.yandex.ru/) of all Yandex services, as well as on the search results pages of the web sites of YAN partners, by setting in the parameters of the advertising campaign criterion of advertisements display «Independent accommodation on different types of sites» with the option «show in search of the disabled». 1 c.u. = RUB 30.